Milwaukee Police released body camera footage Thursday of an officer involved shooting that occurred last month. The Milwaukee Police Department released a video Thursday detailing an officer involved shooting from November. In the nine minute video, officers explain how and why the situation happened, including body cam video, audio and a 911 call. "Officers were flagged down by a citizen regarding a man with a gun on 36th and W. Clark," Tom Casper, Acting Captain of the Homicide Division said. "When the officers exited their squads, the male ran and officers pursued. After a short foot chase, an officer confronted the armed subject and fired three shots, two of which struck the subject." 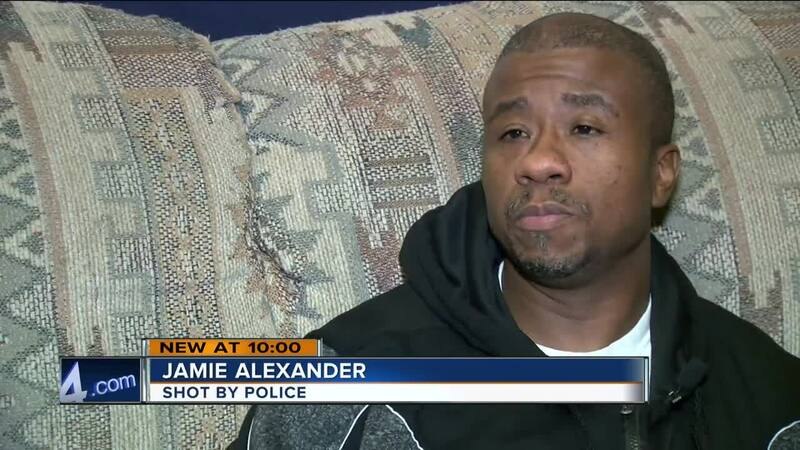 Jamie Alexander, 42 was hit in the back and the leg. He is out of jail now and says things got out of hand quickly. "I was in the house cleaning up when a female from the neighborhood knocked on the door," Alexander said. "I looked out the window and she had a white shirt with blood on it. I let her in and she asked if she could use my phone. I let her use my room [while on the phone] and sat [in the living room.] Ten to 15 minutes later, boom, boom, boom at the door. I said who is it, he said, me. I said, who is me? He's like where that [expletive] at?" Alexander says the man was the woman's brother and they had been fighting. They began yelling at each other in Alexander's doorway to his home. He says he was fearful for his children's lives when he saw the man had a gun. "When I seen the weapon, we wrestled, tussled and I took it," Alexander said. "I put it in my back pocket and the police came. I panicked because I have PTSD. I ran around the house, under the porch and the gun was gone by the time I came up under the porch. I ran in the middle of the field going the opposite way and he shot me in the back." Alexander is a felon. He spent time in prison for manufacturing a controlled substance. He knew he wasn't supposed to have the gun. It's why he panicked when he saw police. "I just got scared and didn't want to get shot," Alexander said. "I end up getting shot anyway." He doesn't shy away from his past but he says this is misleading. "I'm not a good guy," Alexander said. "I'm not going to sit here and say I'm a good guy. I'm not perfect. But I did my time and just got off papers. I'm just trying to live my life. I'm 42. I take care of my kids. I'm not trying to point no fingers or nothing but to me, I feel that cop should have tased me instead of shooting me." In the 911 call released by police, a caller says the man is waving a gun. "I wasn't waving the gun," Alexander said. "The gun was in my back pocket the whole time. I dropped the gun once I came from under the porch." He has questions about why the officer's body cam was not rolling during the shooting. However, according to Milwaukee Police, officers are expected to turn on the body cameras when they feel safe enough to do so. "An officer's body worn camera is not consistently recording during their shift. They are activated and deactivated based on responsibilities. The Department recognizes that an officer's safety is paramount. Members with a body worn camera who arrive on a scene or engage in an enforcement contact must start recording as soon as it is safe and practical to do so. If multiple members are on scene with a body worn camera, all members with a body worn camera will record." Alexander says despite the video starting after the shooting, there is enough proof in the video to show he shouldn't have been shot. He says the officers spotted the gun several feet away from him and out of his reach. "I dropped the gun when I came from under the porch," Alexander said. "I got in the middle of the field and I was running towards 35th when he shot me. I looked in the video and I heard the cop in the background like you drew it. You pulled the gun. No I didn't. When you shot me, I fell directly down. I was running from you. You can't say I was looking towards you because you shot me from the back. My exit wound is here in the front. You shot me back here, my exit wound was in the front. I wasn't facing towards you. I was running away from you." Alexander is currently walking with a cane because of the incident. He says, he no longer can pick up his grandchildren for fear of his leg giving out. He questions his decision making when he ran but he thinks if this happened somewhere else, he'd be fine today. "If I was in Mequon, it wouldn't have panned out the same way," Alexander said. "They would have stopped [the man fighting with his sister.] They wouldn't have came to me. I would have been a hero. I saved my family. But I'm on 36th and Clark. I'm supposed to have faith in police. Not be scared of them." Alexander says his primary focus is on battling the case against him so he can avoid going back to jail. He says his family is urging him to pursue a civil suit against the police department.